The Delhi Capitals and Royal Challengers Bangalore locked horns with each other at the MA Chinnaswamy Stadium. It was the 20th match of the IPL 2019 and the hosts looked on to win their sixth game of the Indian Premier League. 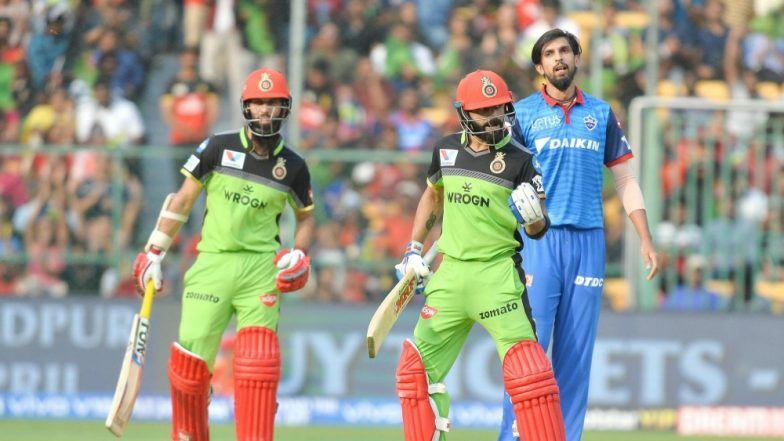 But everything that could go wrong for the hosts did and the team suffered from their sixth straight defeat in the 12th edition of the Indian Premier League. After winning the toss, DC elected to bowl and it was Kagiso Rabada who snapped four vital wickets for Delhi Capitals and the team scored 149 runs. IPL 2019 Points Table Updated: Delhi Capitals Rise to Number Five Spot After Defeating RCB by Four Wickets. Now that was quite an easy target for the Capitals. After the departure of Shikhar Dhawan, Prithvi Shaw and Shreyas Iyer stabilised the innings and gave a good start of the team. Prithvi Shaw lost by 28 runs from 22 balls. Shreyas Iyer made 67 and Colin Ingram scored 22 runs. By the end, of the game, the visitors won four wickets. IPL 2019 Purple Cap Winner Updated: Kagiso Rabada Snaps Four Wickets Against Royal Challengers Bangalore With Most Wickets in Indian Premier League 12. # Virat Kohli has played 19 matches against Delhi Capitals and has scored 761 runs with an average of 69.18. # Kohli has scored most runs against Delhi Capitals. The RCB captain has scored 802 runs. # This is the sixth straight defeat of the RCB. # Shreyas Iyer slammed his 11th half-century. “We thought 160 was going to be competitive. Even 150 was about par. It was quite dry underneath and we knew it would be slow. Not as good as the last game,” said Virat Kohli during the post. Kagiso Rabada walked away Man of the Match award.